I came to the radio studio to find a surprise waiting for me. It was a CD from a local musician, Peter Gerbrand. His CD shows his website as singingsodbuster.blogspot.com. 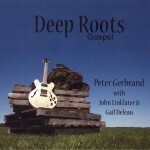 CD: Deep Roots Gospel is a release by local musician, Peter Gerbrand. It also features John Linklater and Gail Deleau. The official release date was September 27th, 2009 at Elim Baptist Church at 645 James Avenue in Beausejour.